The INCRA Pro-II Fence System includes the machined 28" fence section, incremental racks, and 13" Telescoping Stop Extender Bar. Use the selector below to match the Pro-II fence to your INCRA positioner and choose from 1/32" imperial or 1mm metric scales & mechanics. The Pro-II joinery fence is an updated, beefed-up version of the earlier Pro-28 Fence and allows INCRA Jig Ultra positioners to be fitted with the new, super-adjustable Wonder Fence. The Pro-II Fence is standard equipment on all LS-based Router Systems. The extrusion is wider than the original, the face has been machined flat, and the T-slot accepts the larger hardware required by the Wonder Fence. Patented Incremental racks are installed on the rear of the fence for complete compatibility with our ShopStop and Incra Stop, and the fence directly accepts the Jumbo Right Angle fixture. A heavy duty 13" stop extender bar telescopes from either end of the fence to stop cuts on longer boards. If you own a TS System and you want to move your routing operations to a stand-alone router table, an LS positioner and a Pro-II fence will allow you to transfer all of your existing routing accessories. 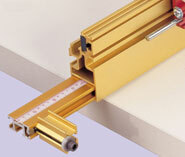 Use the selector above to match the Pro-II to the INCRA fence positioner that it will be installed on. The Pro-II fence is directly compatible with the LS17, LS25, and 12" Ultra Lite positioners. When ordered to fit the Ultra 16" & Ultra 24" positioners, the Pro-II includes an updated steel fence mounting bracket for mounting it to replace the original extruded aluminum fence mounting bracket.